More treats for you TOTs (for those who don't know what a TOT is...it is a Trick-Or-Treater). Here is another FREE download (or treat) of one of my tracks. 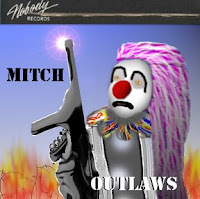 The FREE MP3 download today is Monsters - Creatures (click here to download), taken from Outlaws (and also the Nobody Records Pumpkinland Halloween Sampler) . This song was recorded when I lived in Oakland, CA at the original Pumpkinand Studios. Enjoy the FREE track and please drop me a comment. Remember, all of my CDs are available for purchase at HauntedCDs.com.Be sure and support Halloween Radio by purchasing CDs from us!